Searchbetter Ads is another iteration of notorious adware applications that belong to the Lyrics family and which promise to show lyrics alongside YouTube videos. Remove Searchbetter Ads because, similarly to its other companions Look Forword, LyricsBuddy, and LyricsSing, it will fail to enrich your Internet browsing experience with any beneficial features. Even if you enjoy singing to YouTube videos, remember that this is actually an adware application, meaning that it displays advertising content as well. And all this content, which is provided in the form of pop-ups, in-text ads, banners, and other types of ads, is not going to be limited only to YouTube. Searchbetter Ads will annoy you with these commercial ads wherever you may go on the Internet. If that is not enough, it is possible that this promoted content will lead you to potential threats. As you see, the longer you wait to delete Searchbetter Ads from your system, the greater is the possibility that it might turn into a security risk, not to mention that the ads alone are going to compromise your usual browsing flow. 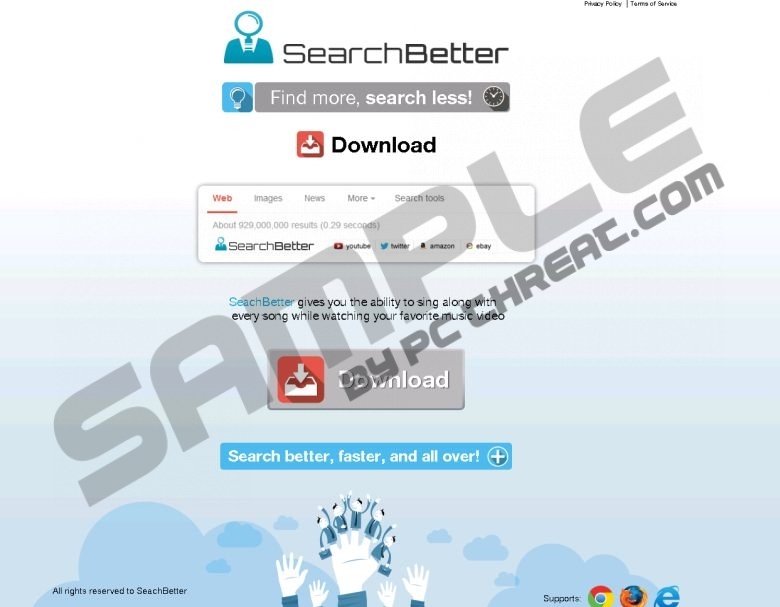 As it is impossible to download Searchbetter Ads from its official site at the moment, it is likely that this adware application is going to enter your system by being distributed with other software; i.e., you might download and install this adware application with other programs. We recommend that you select Custom installation every time you install new software because that will allow you to get acquainted with additional programs and uncheck the undesirable or suspicious ones. If you notice any strange or unfamiliar programs running on your machine or appearing in the program list, remove them because they can put your system in danger. To delete Searchbetter Ads, follow the guidelines that have been prepared for you below. This adware application can be terminated via Control Panel without too much trouble; you simply have to remove it just like any other program on your system. However, it is always suggested to get your hands on legitimate antimalware software that could perform a full scan and a cleanup. This tool will help you remove all the potentially dangerous content from your computer and protect your system from threats in the future. Click the app you wish to remove, select it, and click Uninstall/Change. Click the app you wish to terminate and choose Uninstall/Change. Select the app in the program list and click Remove. Quick & tested solution for Searchbetter Ads removal.